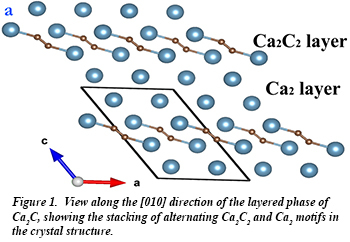 A recent systematic search for stable calcium carbides carried out using an evolutionary structure searching algorithm resulted in the prediction of six stable phases from ambient pressure up to 100 GPa. Among the rich and diverse chemistry predicted in these various phases, a particularly remarkable feature was found in the 2D metallic phase of Ca2C (Fig. 1), which to date is the only known example of a compound in which a metal atom is predicted to develop a negative Bader charge in the presence of a more electronegative atom. A group of researchers including Carnegie's Timothy Strobel, Huiyang Gao, and Jesse Smith from HPCAT, along with colleagues from Jiangsu Normal university, and SUNY-Stony Brook used HPCAT’s 16-ID-B laser heating/microdiffraction apparatus to successfully synthesize and subsequently characterize two of these predicted compounds, Ca2C and Ca2C3, for the first time. These results demonstrate how computational structure searching may be used to define a composition space where new phases may be stable, so that syntheses can be effectively carried out. This powerful synergy between computational and experimental techniques provides an increasingly practical and efficient method for new materials discovery [Y. L. Li et al., Nat. Comm. 6, 6974 (2015)].